Whether you’re a long-established global enterprise or a newly emerging start-up, small teams are the secret to long term success. Empowering small, dedicated, and independent teams, helps workers handle tasks autonomously and encourages the best an employee has to offer. While small companies have long known the benefits of size-controlled teams, even larger organization are starting to catch on. When utilized effectively, small teams are one of your most important resources for getting things done on time every time. But how exactly to do you utilize teams effectively? Here are 5 of our favorite ways to unleash the power of small independent teams. In order to be interested and engaged in their efforts, teams need to understand how the work they do directly influences the customer experience. Knowing that their role makes a real difference provides teams with a sense of purpose and pride. Understanding your role in a larger process also helps teams connect to the overall company mission, supporting employees across every team. Companies can help their workers in this effort by educating employees about a project’s long term goals and development. By painting a clear picture of a project’s outcome, beyond their own piece in the puzzle, teams are better able to see how their effort, no matter the size, contribute to overall customer satisfaction and company success. You can even use renowned enterprise software like MangoApps to track the overall progress of a project, helping employees throughout the development process track its progress. Employers are often hesitant to disclose complete and detailed company information to their teams, fearing that they might lose power or that employees can not be trusted with sensitive or confidential information. While this may seem pragmatic at a glance, it is not an effective way to empower small independent teams. Team members devote countless hours to the work they do and are expected to provide their leaders with all kinds of information. When that courtesy is not returned, leaders often appear suspicious, dishonest, or condescending. No one like to hear about layoffs 5 minutes before they happen. While being transparent with your teams may feel frightening at first, the mutual sense of honesty and respect it creates will dramatically improve employee trust, engagement, and dedication. While freedom can seem scary, it’s a natural next step. Teams need their leader’s trust to make important decisions and work independently. After all, how can you have small independent teams when you take away all of their independence? Successful leaders allow teams to make important decisions, trusting that they have the good judgment and knowledge they need to make the right decision. Providing freedom for your teams doesn’t mean there aren’t any guidelines or performance measurements, or that you never check on or follow up with team activity. Rather, it means taking a step back, trusting that you’ve hired good and competent employees, and putting together a team that works well together. Increasing team freedom is a welcome change for everyone, providing managers with extra time and giving teams the chance to express their independence and exceed expectations. Team members can only bring out their best performance when their own personal needs have been successfully met. And while managing a successful home and private life ultimately comes down to the individual employee, this effort can be greatly enhanced by an effective work-life balance. Providing a flexible and personalize work-life balance is an organic part of enabling team independence. When teams have the freedom to determine how and when they work together, they feel more empowered and committed to their tasks, while still being able to take care of personal commitments and recreational activities. The needs and time commitments of every team are different, but with a few basic company guidelines and a dependable team, they’ll be able to work out the best balance themselves. And with modern-day team communication tools, adjusting your schedule to meet individual team needs is easier than ever. No matter how small your team might be, they need access to innovative collaboration tools. This is especially important if teams are geographically separated or work away from the office often. 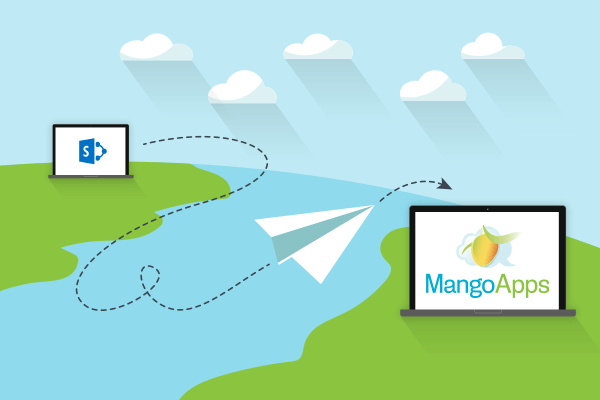 Collaboration technology, like MangoApps, lets team members communicate and work together anywhere with an internet signal. Collaboration tools are also a huge help when teams need to work together to accomplish a specific goal. Successful tools allow for video calls, file sharing, discussion platforms, and more. Collaboration tools help employees with every aspect of becoming a successful team, including understanding the importance of a project, increasing team independence, and creating a better work/life balance. They’re also a great way for teams to access company-wide or department-wide resources. Organizations can’t survive without dedicate, creative, and insightful employees. Small team, when well created and given the power to work independently, are how to make that happen. These teams can innovate and explore new ideas while successfully completing projects on time. 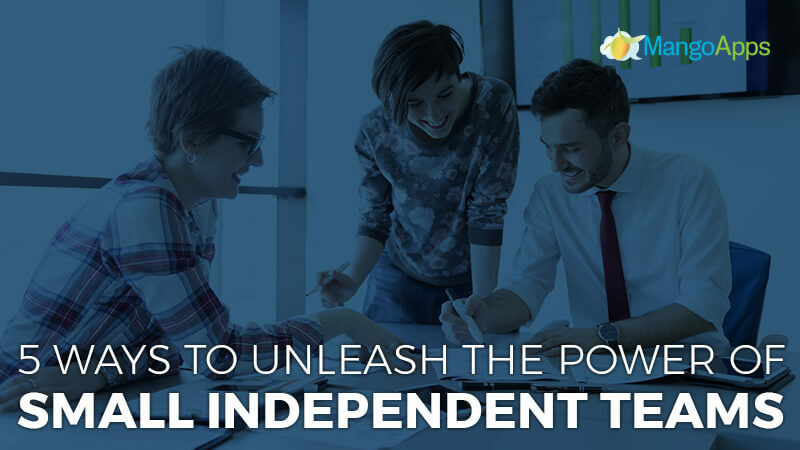 Contact us today to learn more about empowering small independent team, or how MangoApps helps teams achieve their best every day.